Partner has OCD – How to help your partner. Obsessive-Compulsive disorder (OCD) is a mental disorder that not only affects the person who has it, but also the people around them. 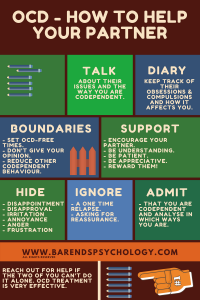 If your partner has OCD, you may have noticed that you need to reassure your partner a lot, that your partner is very insecure, and worries a lot about possible risks. Sometimes your partner may ask you to take over certain tasks or have the last say in big decisions. At other times you may feel like there is no place or time for you to talk about your issues, because your partner is too absorbed by their own problems. When your partner has OCD, it’s very important to stay in charge of your own life, and to reduce the effects your partner’s OCD has on your relationship. 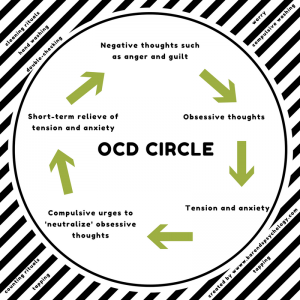 This page is created for those people who’s partner has OCD and needs some guidance in dealing with the effects OCD has on their relationship and personal life. Be aware that not everyone with OCD experiences the same symptoms and that the severity of each symptom can differ. Step 1: Partner has OCD – Understanding your partner. Although it may not always seem like it, your partner suffers from OCD on a daily basis. And each day it may get a little worse. Out of shame, your response, or just not to bother you, your partner may not talk much about their OCD related issues. However, understanding what it means to have OCD is important if you want to improve your relationship, because their OCD related issues are fear based. And their fear is real, how unrealistic it may seem, their fear can lead to panic attacks. They are extremely worried something bad may happen to themselves and the people around them. They see risks everywhere and for them -if they don’t do anything about it- these risks are likely to come true. The extreme anxiety and worry they experience takes up a lot of their energy and is time consuming. They feel powerless and helpless in many -in their eyes- potentially dangerous situations, which leads to behaviour to regain control over the situation. To regain control over the situation they take precaution measures such as planning way in advance, worrying a lot, performing rituals and compulsions. More often than not, these behaviours are misunderstood and ridiculed by their friends and family. They experience a lot of shame and guilt because of their obsessions and compulsions, and they usually stop sharing. This leads to a more withdrawn life. Again, they feel powerless, helpless, and lonely, because no-one really understands them and they can’t do anything about their extreme anxiety and worry. They may experience feelings of hopelessness, despair, and fear regarding chances of recovery, especially if they had a previous unsuccessful therapy-experience. Their fear may increase due to the realization that their OCD symptoms are getting worse, and that they may be able to control their anxiety temporarily, but that it keeps coming back. They have a troubled future perspective, because their obsessions and rituals prevent them from changing much of their behaviour. On the contrary, their obsessions and compulsions require more and more time as the OCD symptoms progress. Now that you know what your partner goes through on a daily basis, you can imagine that extra stressors are not helping them in any way. Therefore, it’s important to make sure that they don’t have to deal with extra stressors, such as relationship issues or worries about your criticism. In fact, these stressors could lead to more anxiety and worry. Try to remain calm and understanding when it comes to your partner’s OCD related issues. Step 2: Partner has OCD – Understanding codependency. Codependency in OCD can be quite subtle. It basically means the negative impact your behaviour has on your partner’s OCD symptoms, causing these OCD symptoms to either exist or worsen. If your partner has OCD, it’s possible you enjoy the fact that your partner likes to (1) plan events way in advance, (2) keep the place tidy and clean, (3) asks for your opinion a lot, and (4) relies on you for big decisions. It may even be one of the reasons you fell in love with your partner in the fist place. And as convenient as it is for you, it has a negative impact on your partner’s OCD symptoms. You are validating your partner’s irrational sense of control by allowing him/her to plan things way in advance and to allow him/her to keep the place tidy and clean. At the same time, your opinion on certain matters alleviate their anxiety and worry temporarily. This means that they learn to turn to you for decisions, because it alleviates some of their OCD symptoms. There are probably some more ways in which the two of you are codependent. Try to figure out in which ways you are and analyze in which way they make you feel better about yourself. However, this doesn’t mean you have to change this overnight. By changing things suddenly, their OCD symptoms get worse instantly and this is counter-effective when your partner has OCD. It’s better to take it slow and continue reading for tips and advice. (Advertisement. Please continue reading for more advice on this topic). Step 3: Partner has OCD – Beating OCD together. Talk about OCD: have a conversation about the way OCD negatively affects your lives. Talk about the fact that your partner has OCD, how the two of you are codependent, and that your partner is not the only one who needs to change. This way your partner feels more supported and hopeful that the two of you can do this together. If the two of you have a feeling you can’t do this alone, please contact a therapist or counselor who has experience in dealing with OCD. At Barends Psychology Practice, we are specialized and experienced in treating OCD. Contact us for a free of charge appointment. Keep a diary: help each other by keeping a diary of your partner’s compulsions and obsessions (your partner can do this alone) and the times you are ‘benefiting’ from your partner’s OCD (emotionally, mentally, physically, and so on). Set healthy boundaries: use the diary to set healthy boundaries for the both of you and discuss this together. You can try to reduce your codependency by refraining from giving your opinion on certain topics (think of ‘clothes to wear’, ‘groceries’, ‘compulsions and obsessions’). At the same time, encourage your partner to make her/his own decisions. If you disagree with the decision, please don’t show your disapproval. The both of you can agree on OCD-free zones: moments where talking about OCD is prohibited. Think of during breakfast, lunch or dinner. Or use set times to discuss OCD-related issues. This way the both of you can enjoy a stress-free moment with each other. Support your partner: your support is extremely important when your partner tries to change their behaviour (obsessions and compulsions). This will motivate them even more and bring the two of you closer together. If your partner tries to bring down certain obsessions or compulsions, do not ask about their feelings afterwards. Reducing the amount of compulsions or obsessions creates a lot of fear (and fear is something they don’t want to feel). Instead, focus on their biggest fear and ask if whatever it is they fear the most came true. Their answer to this question is most likely negative and that’s exactly what your partner needs: to understand that reducing compulsions or obsessions does not lead to a disaster. Please note: this step can be quite tricky without professional help. If your partner has a negative experience this exercise is counter-effective, and could lead to a (small) relationship crisis. Hide your disappointment: it’s likely that your partner will have a few bad days due to stress at work or certain major life events. Bad days often lead to relapse: holding on to old obsessions and compulsions. And this could lead to disappointment from your side. Unfortunately, showing your disappointment demotivates your partner and makes them feel like a loser/failure and that their situation is hopeless. Instead, focus on the progress your partner made so far and realize that your partner is capable of reaching that same level again. You could help your partner by focussing on the reason why your partner had a bad day and to try and reduce the impact these stressors have on your partner’s life. Ignore a relapse: if it’s the first time. It could be just once and mean nothing serious. If, however, it happens more often, it may be a good idea to talk to your partner about it. Talk about their reason behind increasing the amount of obsessive/compulsive behaviours. If their reason doesn’t make much sense, try to explain this to your partner. Do this while being understanding and patient.